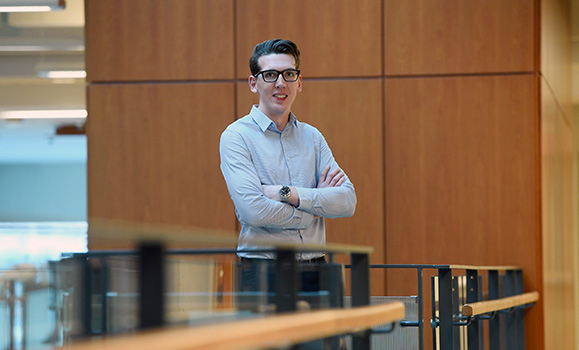 One month after graduating in May with his Bachelor of Computer Science degree, Andrew Sealy was back on campus — this time as a student in the Corporate Residency MBAprogram. He had to hit the ground running. The first few months of the program took him through an intense summer academic term that included the PPE (Personal and Professional Effectiveness) course, which is designed to help students prepare for their corporate residencies by focusing on skills related to leadership development and career management. Though it meant giving up on any thought of a lazy summer, it was a really valuable few months for Andrew. He feels the help he received through the resume boot camp and mock interview sessions set him up for job search success. And since the residency was one of the main reasons he chose the program, that was important. Andrew knows a thing or two about the significance of work experience. During his Computer Science degree, he participated in three co-op terms. Each one gave him more involvement and took him a bit further out of his comfort zone. His last work term, at Deloitte in Toronto, provided him with larger scale projects and put him in more of a client-facing role. It was that experience that inspired him to pursue his MBA. It also helped sustain him while he participated in a remarkable 15 interviews for his corporate residency in just one week. He admits it was a busy week but says it was also very rewarding. Because he’d been through the process, he knew the key to success is knowing yourself. Clearly, his approach paid off — he received five different job offers from employers in Halifax, Toronto, Ottawa, and Vancouver. When he looks back on it, Andrew thinks his background in Computer Science was his main advantage. 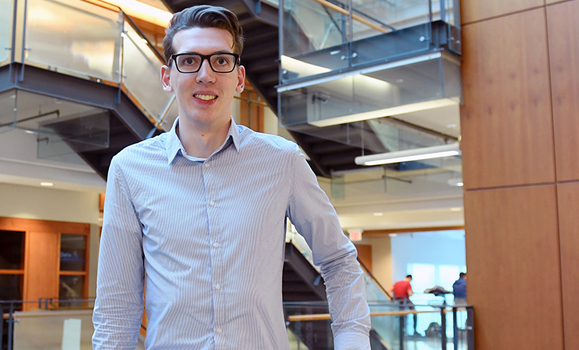 After quite a bit of consideration and consultation with his professors, Andrew decided to accept a job with BMO as a marketing coordinator on their Customer Analytics team in Toronto. He’ll start this month. Once his residency is complete, Andrew will return to Halifax for another year of studying before he graduates. When asked what he thinks of the program so far, Andrew says it’s been hard work but the relationships he’s built with his professors have helped him succeed. And so far, it’s worth it. This story was originally posted on Dal News.